Is there a better alternative to VelaClock? Is VelaClock really the best app in Adventure category? Will VelaClock work good on macOS 10.13.4? VelaClock is a world clock widget with a highly configurable user interface. 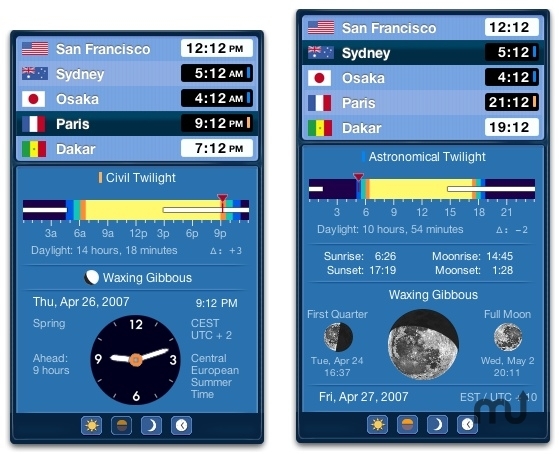 Users can quickly display the time of sunrise, sunset, or twilight, duration of daylight, moonrise, moonset, phase of moon, time zone information and more. Deluxe version: fixed crash on OS X 10.8 (Mountain Lion). Fixed ability to click checkboxes on back of widget for Mountain Lion. Corrected size of daylight bar and moon on new retina display. VelaClock needs a rating. Be the first to rate this app and get the discussion started! A light level bar that gives the user a picture of the 24 hours of natural light (bright daylight, three kinds of twilight and night) for the current day. A thin white bar indicates when the moon is visible. Daylight duration and the change in minutes of daylight from the previous day are also displayed. Specific times for sunrise, sunset, moonrise and moonset. Begin/end times for civil twilight, nautical twilight, and astronomical twilight can also be displayed. An image of the moon as seen in the sky above the currently selected city. This image accurately depicts the angle of the moon's crescent. Because this angle can change dramatically within the span of an hour, it is updated once a minute, as is the moon's phase. This view also contains the name of the current phase, as well as local times for the next and previous phase events (new, quarter, full). An analog clock and detailed time zone information, including full time zone name and the number of hours the selected city is ahead or behind the user's current time zone (as set in System Preferences). The current season name (winter, etc.) is also displayed. No Internet connection is required. VelaClock is a unique widget in that it is completely self-contained. Many widgets are lightweight front-ends to Web services; such widgets require an Internet connection. By contrast, VelaClock is designed to function without an Internet connection, and so is particularly useful for laptop users away from their home or office. Astronomical calculations are performed by an internal code module. All time zones (built into VelaClock) are current as of July 20, 2012. Locations show the correct time (current, past, future dates) when running OS X 10.8, 10.7, 10.6, 10.5 and 10.4 (Intel/PowerPC). Updated Daylight Saving Time rules for Morocco.